4 Popular Volcanoes to See in the Philippines -- And Yes, You Can Climb Them! The Philippines, being included in the Pacific Ring of Fire, is home to some of the most active volcanoes. While it might seem dangerous, there are volcanoes in the Philippines that adventure-seekers would love to actually climb. But of course, with extra precaution! #1 - Mount Pinatubo (Zambales/Tarlac/Pampanga): There is beauty after chaos, and Mount Pinatubo is definitely the proof for that. After the eruption in the early 90's, it left nearby towns devastated but it has also formed a majestic crater lake. It is one of the main attractions during the Pinatubo climb. #2 - Taal Volcano (Batangas): Though considered one of the smallest volcanoes in the Philippines with an elevation of 311 meters, it still is exceptional as what it lacks in height, makes up in beauty. The climb is easy and can be completed in 45 minutes. It is located in Taal Lake but it also has a crater lake with a viridian green color. #3 - Mount Apo (Davao): Located between the city of Davao and the Davao del Sur province, Mount Apo is the highest peak in the Philippines. The climb is complicated and it may take three to four days to reach the summit but hikers consider it an achievement. It is a home to over 270 bird species and other rare animals, plus the panoramic view is what makes the hike worthwhile. 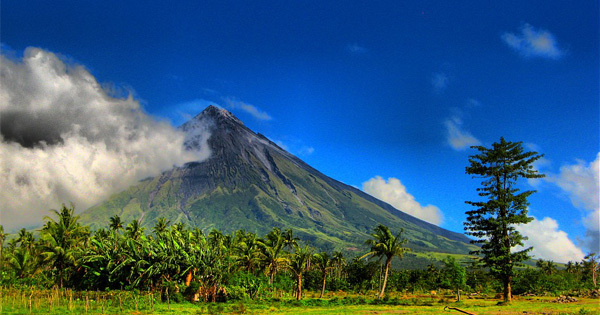 #4 - Mount Mayon (Albay): Mount Mayon is the most active volcano in the country but it is definitely a sight to see. The perfect conical shape is what draws the travelers near. Climbing it is truly a remarkable experience filled with the thrill that it might erupt anytime. Make sure to check local advisories first to avoid accidents.